In December I ordered Board Game Bento's "Fun in the sun" themed box to deal with my winter blues. The highlight of that box, for me at least, was Cottage Garden. Place the Nursery in the middle of the table on the side corresponding to the number of players. Fill the 16 spaces of the Nursery with flower tiles. Create a path next to the nursery with the remaining flower tiles and place the wheelbarrow at one end. The wheelbarrow will mark the start of the Garden Path. Give each player a planting table. Place 3 orange cubes and 3 blue cubes on the starting spaces. Each player receives two cats. 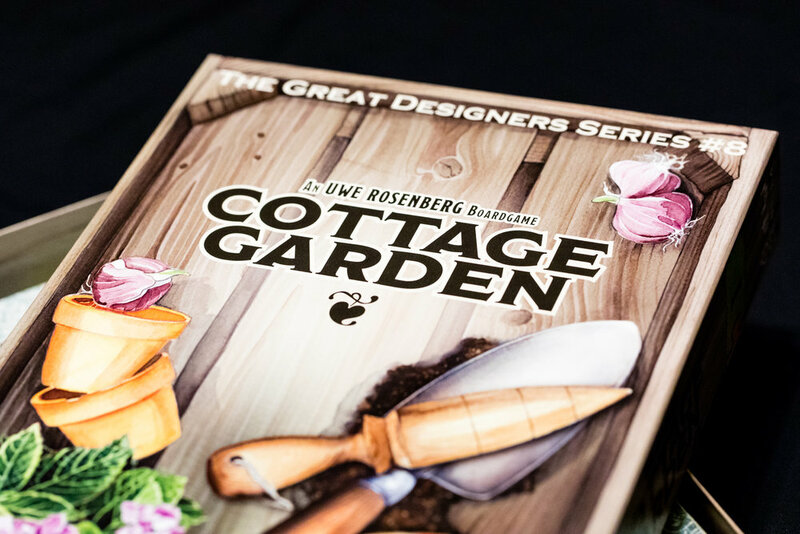 Each player randomly draws two flowerbeds, placing them in their planting table (one showing the dark side and one showing the light side). Place one of the remaining flowerbeds next to the nursery with the light side showing. Beside the nursery place the parasol, the remaining cats, the flower pots and the beehives. Return everything else to the box. A turn consists of four phases. 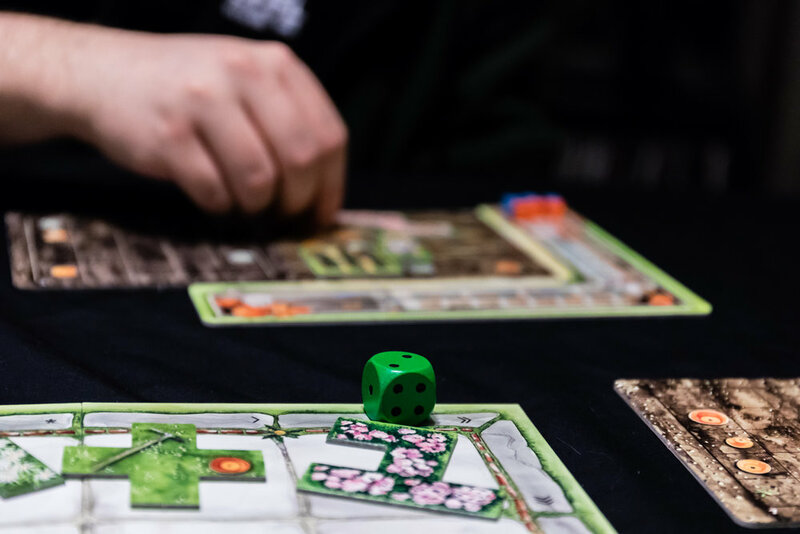 Check the nursery spaces in the row or column (or diagonal in a 4 player game) indicated by the position of the gardener dice. If at least 3 of the spaces are empty you must fill the empty spaces with tiles from the garden path. 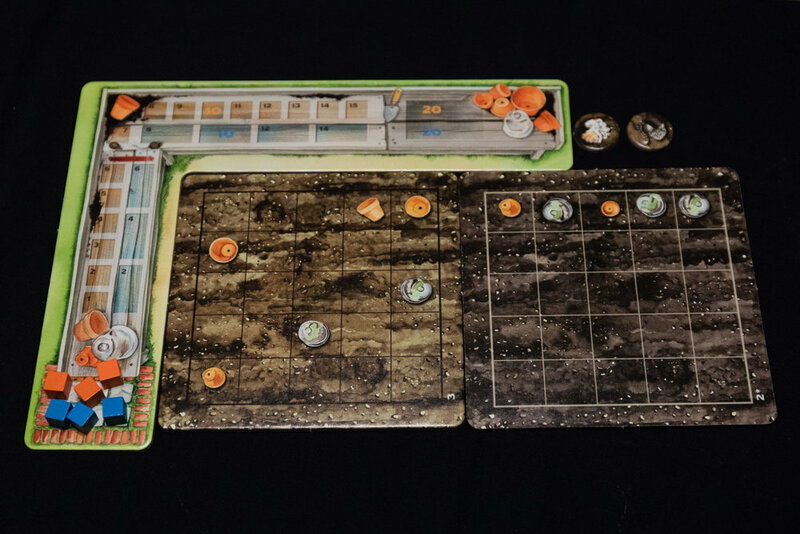 To do this, take the tile directly in front of the wheelbarrow and place it on the empty space in the gardener row closest to the gardener dice. Continue until the row is filled. You must take either a flower tile from the nursery or a flower pot from the reserve. When planting you place a tile on empty spaces within your flower bed. 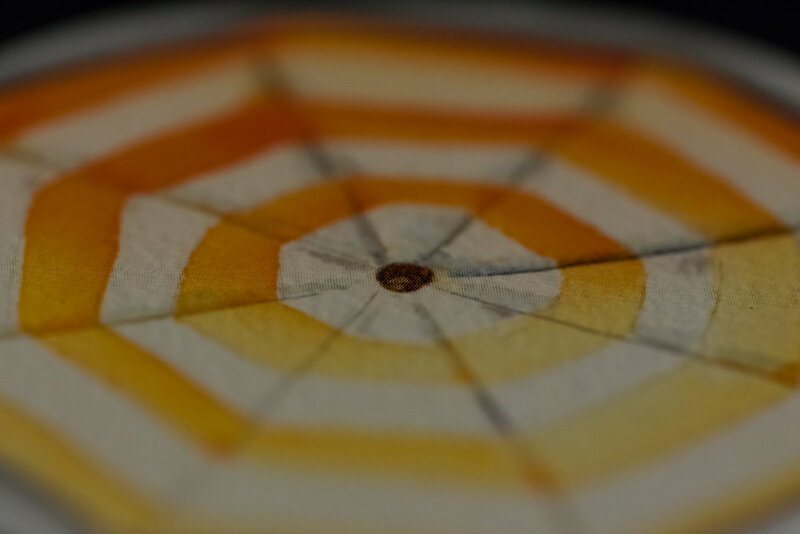 You can turn over or rotate tiles any way you like but you may not overlap tiles, place a tile that protrudes off your flower bed or move any tiles placed on a previous turn. You may also place cats as free actions during this phase. If all of the spaces in one of your flower beds has been filled (with a flower tile, flower pot, cat token, printed flower pot or printed garden cloche), it is complete and must be scored. Move only one of your orange cubes along the track as many spaces as there are flower pots visible in your flowerbed. Move only one of your blue cubes along the blue track as many spaces are there are garden cloches. If both flowerbeds are completed in the same turn you may choose which order to score them in. If you move a cube across the red line, receive a cat from the supply. If you have more than two cats, you must use one immediately. If you move the last of your orange or blue cubes off the start space, you may gain a flower pot from the supply and place it immediately. The first player to move a cube onto the Target Space (20) receives a bonus tile with two behives (worth 2 points). The second player to do so receives a bonus tile with one beehive (worth 1 point). Each player can have only one beehive tile. 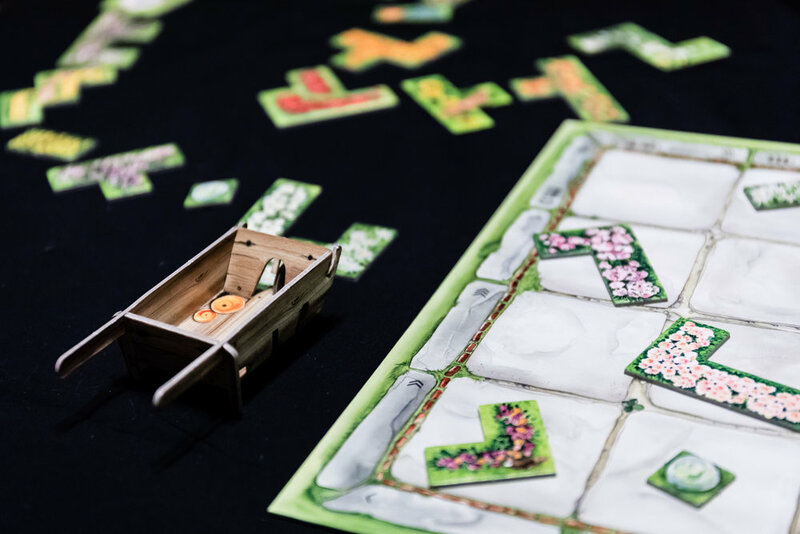 After scoring all flower pots and garden cloches - cat tokens are returned to the general supply, flower tiles are returned to the end of the flower path, the emptied flowerbed is flipped to the opposite side then placed in the general supply. The emptied flowerbed is then replaced with the other flowerbed from the general supply. 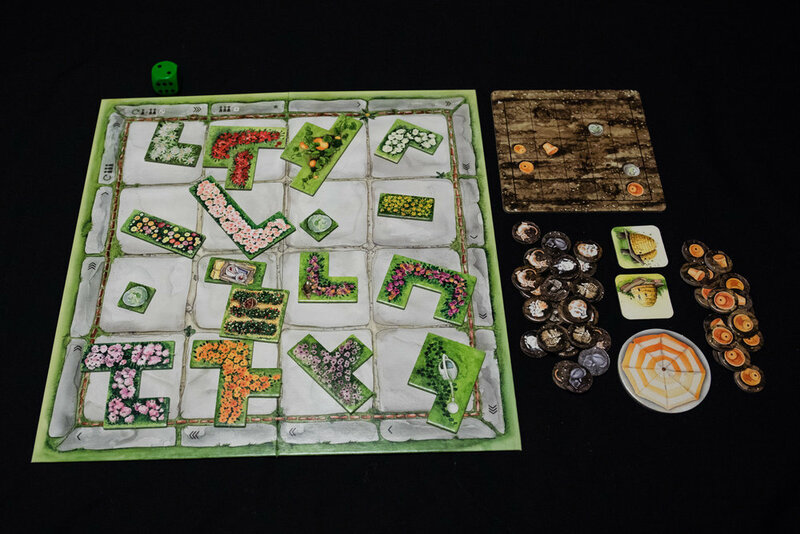 At the end of your turn, move the gardener one space further along the edge of the board. When you reach the turning space (Indicated by a circular arrow), Increase the number on the gardener die by one. When the die reaches 6, the final round begins. 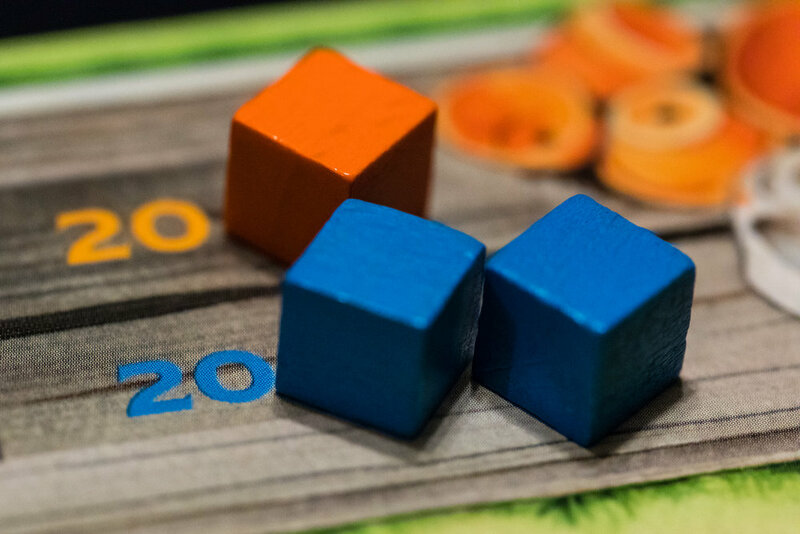 Before each turn you lose 2 points (either by moving one orange cube back 2 spaces or one blue cube back 1 space). Whenever you complete a flowerbed it is removed from the game and you do not replae it. If you have no flowerbeds remaining, you do not lose points and the only action you take is to move the die one space. The game ends when all flowerbeds have been removed from the game. The player with the most points is the winner. Each orange and blue cube is worth the amount of points according to it's position on the track. Each beehive is worth 1 point. The components are good quality and suit the theme of the game. The box isn't divided in any way so the game pieces do just get thrown into the box with the exception of the few items that can be bagged. The umbrella was a well thought out component. I like that the game encourages you to pick up pieces and see how they fit into your flowerbed and the umbrella allows you to pick up a piece without forgetting where you grabbed it from. This is such a great idea, especially for younger players or any players who have trouble visualizing the placement of a tile. This option makes the game friendlier for players of all skill levels. I wasn't the biggest fan of the garden path as I found it mildly tedious to maintain. You have to take the tiles from in front of the wagon, move the wagon forward and find room on the table to place the old tiles at the end of the path. It was more work than I wanted to do. The wagon however is aesthetically pleasing and fits the theme nicely. I assume the reason for the garden path was so the same tiles weren't being reused too soon. It also allows you to see which garden tiles will be added to the nursery next, allowing you to think ahead (which I like). No matter how many players, there is always the same number of turns. I enjoy this aspect because I know If I only have X amount of time, that I can fit in a game of Cottage Garden. This can be a bit faster or slower depending on how long players suffers from analysis paralysis. A friend of mine had actually told me he wasn't a big fan of the game and that he found it too easy. It turns out that his group was replacing every tile immediately after drafting them. When he found out that you only fill a row if there's 3 or more tiles missing, it changed the game immensely for him. I love trying to figure out what my options will be in my subsequent turns and maximizing my score. I love playing the game in solo mode although I still haven't been able to clear the suggested goal of 70 points. I came so close one game, ringing it at 69, so I'm still motivated to tweak my strategy and hopefully eventually reach the target score. Even with more players there is very little player interaction in this game. Everybody is working on their own puzzle and not interfering with their opponents flowerbeds which is great if all the players enjoy this type of game. You could potentially sabotage another player's plan by drafting a tile they might be waiting for which can be fun but I'm usually too focused on my own garden to worry about that. I love that there are certain events on the score board that give you small bonuses. I enjoy trying to find a balance between getting extra cats by passing the blue line with my scoring pieces and trying to get as many cubes as I can to the 20 point mark. The final round really gives you a run for your money if you plan too poorly. Trying to complete your flower beds as quickly as possible to avoid losing too many points is stressful but taking advantage of cubes near the blue line can be extremely helpful. If you move a cube behind the blue line and score it again, you gain another cat which helps you towards completing your last flowerbed. I really enjoy this game both solo and multiplayer. I love having a not too quick but not too long puzzle game on my shelf. It's easy to teach and play which makes it ideal for many of my playing groups, especially when we have a mix of seasoned and newer players. What is your favorite Uwe Rosenberg game?